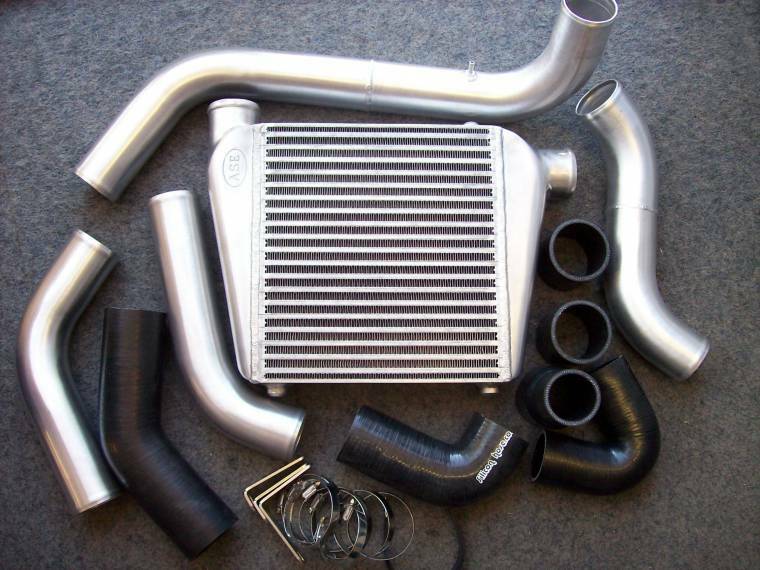 The torque increase delivered by fitting a Intercooler Kit to a turbocharged diesel 4WD can be substantial. The engine generates greater output due to the gains in efficiency derived from the reduced ambient temperature of the inducted air, and increased airflow. The reduced temperature allows the use of higher fuel load and boost pressure settings for achieving even greater output. Increasing both turbocharger boost pressure and fuel input increases combustion temperature, hence energy output of the engine. Ultimately the maximum output of the engine is limited by combustion temperature and engine component failure. An Intercooler is fitted between the turbocharger outlet and the engine intake manifold to reduce intake air temperatures. This allows the setting of higher boost and fuel loads but retain moderate combustion temperatures, required for engine longevity. 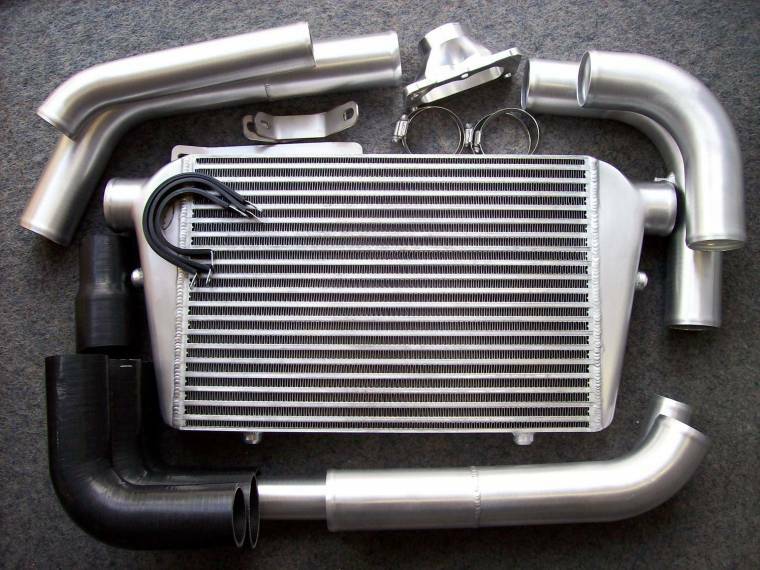 However, an Intercooler is not a must have, it depends on what performance improvement you want or need to achieve from the engine. This is really the crux of the performance improvement decision - what do you need your vehicle to do? Each person is different, different tyre sizes, different accessories fitted (read weight), different towing issues - these are the factors that relate to the turbo and/or intercooler fitting to your vehicle. If you want to run boost over 10psi, the intercooler does becomes a must have. Higher boost means more air = more fuel to make the mixtures balanced. Below that 10psi boost, you can fit an intercooler if you want, but there is no major gain in performance or fuel economy. Intake temperatures will be slightly lower so combustion temperatures will be slightly lower but running temperature will be unaffected as the thermostat regulates water temperature. So, the issue is where do you need the torque to be in the RPM range? For performance as a comp car in the next event. From there, look at Cost, Fuel Economy, Reliability and Warranty. The graphs below (click to enlarge) display the obvious advantages of turbocharging and intercooling the normally aspirated engine. 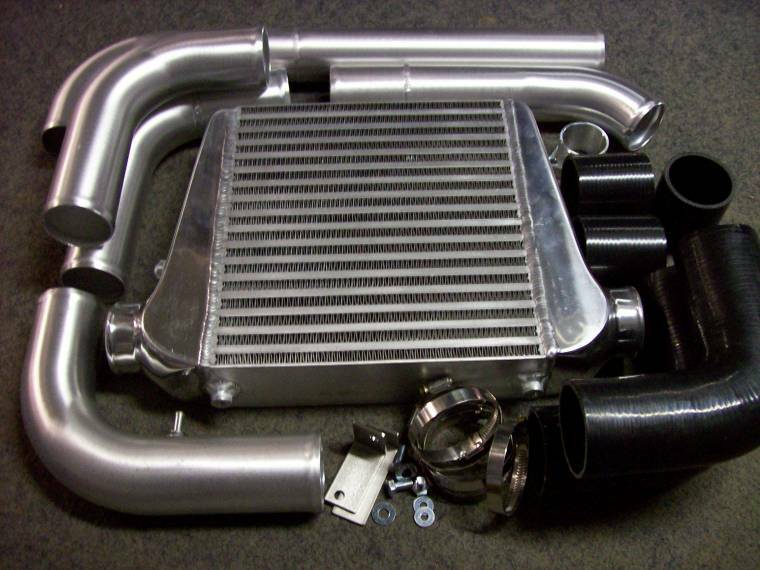 The end result of fitting an intercooler is an engine with more torque, greater flexibility through the RPM range, predictable smooth power with equivalent reliability and comparable engine life. Top mount Air to Air kits require a scoop and thermo fan to be efficient. Kits include these plus loom, all silicon hoses, clamps etc and simple DIY instructions. Top mount kits are not as efficient as Front Mount Kits due to the radiation of heat from the engine into the intercooler core. 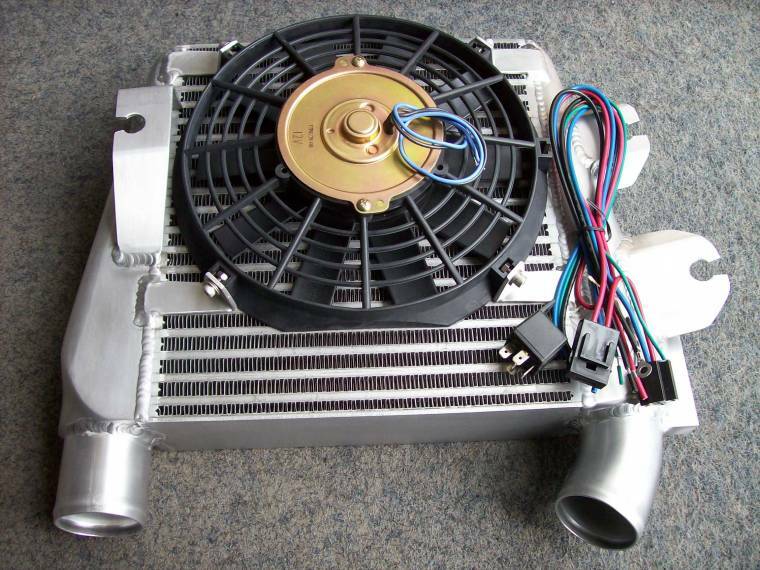 The electric fan and the bonnet scoop will direct air through the core to cool it down and but instead of the cooling effect actually cooling the intake air, a lot is lost cooling the alloy core itself. However, if you have a bull bar &/or winch and lights etc in the front, you are going to get better airflow from a top mount. Unlike a front mount, a Top Mount will not get clogged with mud or seeds either - being so high. The 'Glycol to Air' Intercooler has the advantage of improved thermodynamic efficiency due to the liquid-air heat exchange. Its close proximity to the intake manifold means there is no opportunity for reheating of the compressed air or reducing airflow and its performance is not related to vehicle speed. Another advantage is an easy install as only 19mm heater hose is used (to transport the glycol to its own radiator), rather than 65-75mm or greater air hose. However, electrolysis can corrode the heat exchanger core, allowing the fluid to enter the combustion chamber. This is not common, but can happen, more so on older vehicles or vehicles that have had a collision repair - where earthing of the body is poor. 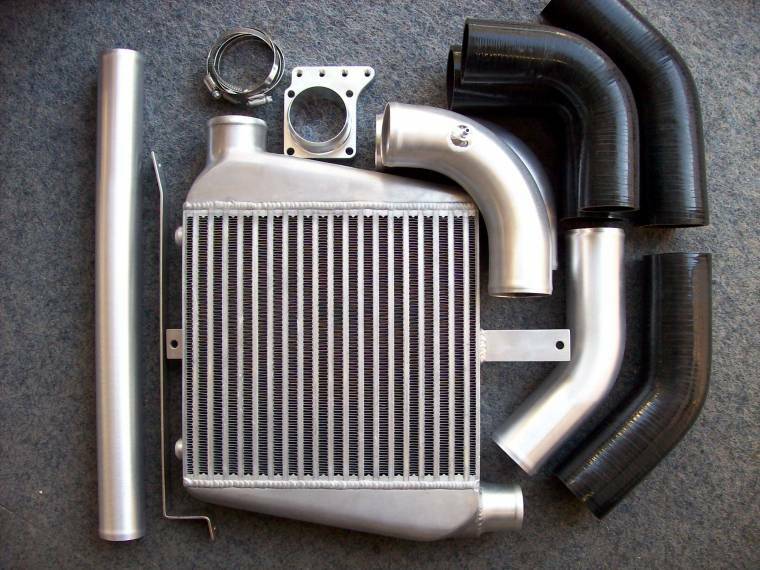 'Front Mount' style Intercooler Kits are in located immediately behind the grille, so there is almost no transfer of heat from the engine or engine bay to the intercooler core - a common problem with the 'Top Mount Air to Air' style. Similar heat reductions are achieved to the Glycol-Air' kits over approximately 70km/hr. 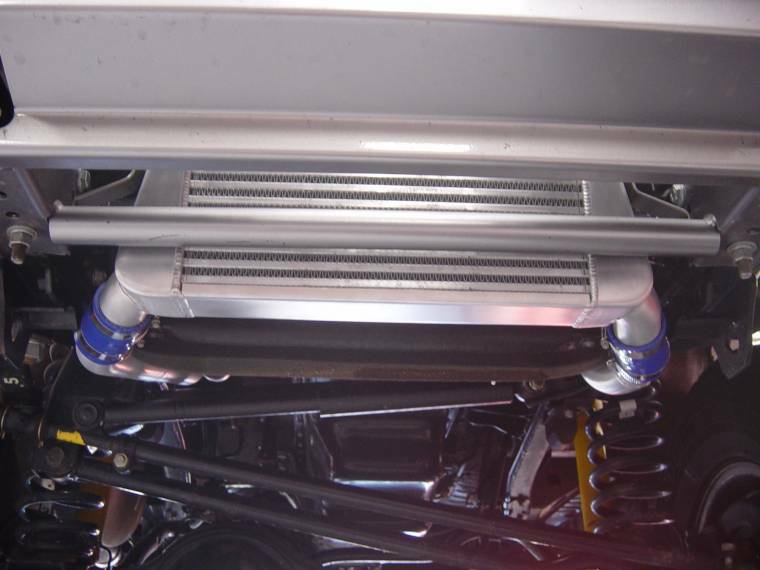 Intake air temperatures can be reduced to as low as 15degrees above ambient. Cost effective price for very similar torque gains. Complete with instructions for DIY fit. Significant improvements can also be gained from fitting a Snorkel, Unifilter foam aircleaner element, advanced injector pump timing & upgraded injector settings for pre-ECU diesels and a Power Chip for ECU controlled diesels.